Scheda: Nazione: Italia-Francia-Germania - Produzione: Titanus, Mediaset, Taurus Film, Canal Plus - Soggetto: Lucio De Caro - Sceneggiatura: Lucio De Caro - Fotografia: Giancarlo Ferrando - Montaggio: Jenny Loutfy - Scenografia: Francesco Bronzi - Costumi: Nanà Cecchi - Musiche: Marco Frisina - Effetti speciali: Fabio Traversari - Formato: Color - Durata: 198' (in due parti). Cast: Ralf Bauer, Lea Bosco, Joachim Fuchsberger, Mandala Tayde, Cedric Baumier, Pierre Cosso, Pier Paolo Capponi, Bekim Fehmiu, Stefano Corsi, Daniel Ceccaldi, Thure Riefenstein, Francis Fulton-Smith, Jean-Pierre Cassel, Laurence Flaherty, Pierre Franckh, Dominique Hulin, Giovanni Lombardo Radice, Maria Schneider, Daniel Vérité. Trama e commenti: cinematografo.it - film.spettacolo.virgilio.it: «Figlio del re di Bretagna, il giovane Tristano rende un prezioso servigio allo zio, il re Marco di Cornovaglia, uccidendo l'ostile gigante Morholt, figlio del sovrano d'Irlanda. Gravemente ferito dagli invidiosi cortigiani e abbandonato su una barca alla deriva, Tristano approda proprio in Irlanda dove si innamora di Isotta, sorella di Morholt». Plot Summary, Synopsis, Review: IMDb: «After the death of his father, prince Tristan is living in Cornwall at the court of his uncle, King Marke, who treats him like a son. When the Irish king sends his son Morold over to demand high tax payments, Tristan challenges him to combat. He manages to kill Morold but is very badly injured, and is placed in a boat to be healed by the magic powers of the sea, which takes him across to Ireland. There he is discovered by Isolde, Morold's sister, who nurses him back to health together with her mother. Before his identity becomes known, Tristan travels back to Cornwall where the barons are urging King Marke to finally choose a wife for himself. When the king hears of Isolde's beauty he sends Tristan across to bring her back to him as a bride. Isolde is appalled at the way her father welcomes Morold's murderer, and at his desire to marry her off to a strange king. On the voyage back, she wants to poison both Tristan and herself, but the bottle contains a love potion: the two of them fall in love with each other and cannot leave each other, even after Isolde's marriage to Marke. 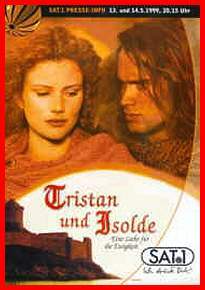 When their relationship is discovered, Tristan is forced into exile in Brittany, where he is given a warm reception by Duke Hoel. The duke's daughter, Isolde Weisshand, tries in vain to win Tristan over. When Tristan hears that the barons have risen up against King Marke he travels back to Cornwall and saves the king's life and crown, but is then forced to go back into exile, seriously injured. Close to death, he sends for Isolde: she is the only person who can save him. However, the spurned, jealous and disappointed Isolde Weisshand foils the two lovers' reunion by telling a lie. Bereft of all hope, Tristan falls on his sword just before his Isolde arrives. She follows him into death, in order to be reunited with him for ever more». Film tv: miniserie in due puntate. Conosciuto anche con i titoli: Heart and Sword; Tristan und Isolde - Eine Liebe für die Ewigkeit; Tristano e Isotta.